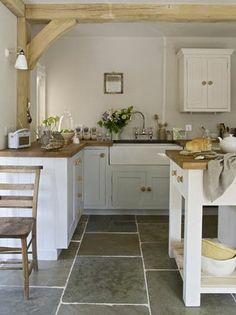 Natural stone is unsurpassed for beauty and distinction, and despite requiring more care than some flooring types, remains a popular choice where elegance is preferred. Our natural stone guides include discussion of granite, marble, travertine, limestone and slate flooring. These materials have been used for thousands of years, and today’s stone flooring products are more beautiful and durable than ever. In order to help you research natural stone flooring and compare it to your options including hardwood, laminate, ceramic tile and luxury vinyl tile, we’ve created a set of guides. 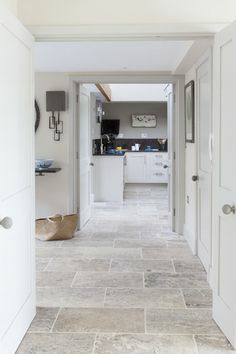 Natural Stone Flooring Buying Guide: Consider the pros & cons of natural stone flooring, wear and durability, patterns, tile and slab sizes, natural stone floor costs and FAQs. Natural Stone Flooring Removal and Installation Guide: This guide overviews the process of removing old flooring, installing the new and considering DIY natural stone flooring installation. Natural Stone Flooring Repair Guide: Natural stone can be damaged, but repairs are possible. This guide explores what is involved. 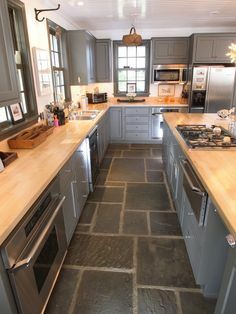 Natural Stone Flooring Price Guide: Here is comprehensive information about natural stone flooring costs for the material and for installation. Natural Stone Flooring Maintenance and Care Guide: Caring for natural stone floors isn’t as daunting as some think. This guide includes tips for keeping your flooring looking fantastic. 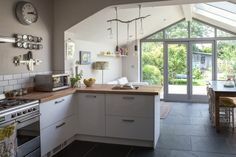 As you browse this site, you’ll discover these types of guides for all kitchen components including flooring, cabinets, countertops, islands and more! 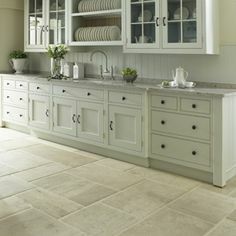 Be inspired and informed through beautiful pictures and more on our natural stone flooring Pinterest page! 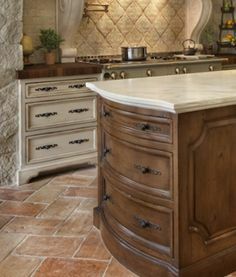 See what natural stone looks like in dream kitchens like you’re planning for your home. You’ve got options during your kitchen remodeling project. You can either find the flooring contractor or leave that to a general contractor (GC) who has relationships with flooring installers. Finding the flooring installer yourself is the best way to reduce your total cost. First, you’re not paying a GC to do it for you. Secondly, you can shop around for an experienced installer with the best prices. The way to do this is to request written estimates from several installation companies that know they’re competing for the work. If you choose to find the installer, we can reduce the hassle of it with one quick and convenient form. 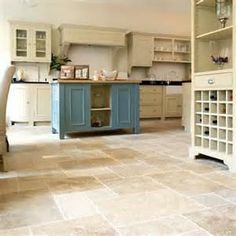 The service puts you in touch with prescreened local natural stone flooring installers that know they must give very competitive bids to be considered. The process gives you the opportunity to learn about the experience of each installer as well as their prices before you make your decision. There is no obligation or cost for using the service.